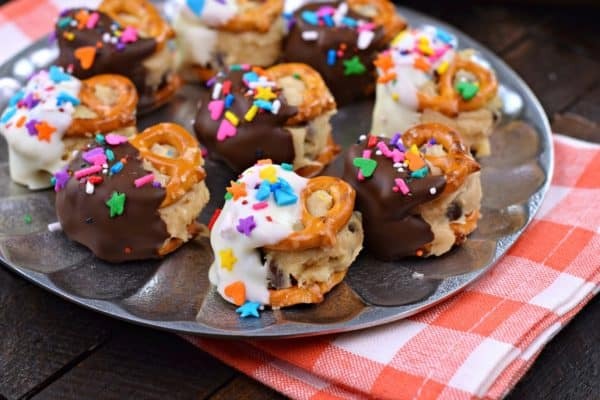 A delicious, eggless treat, these Cookie Dough Pretzel Bites are no bake, and perfect for parties. 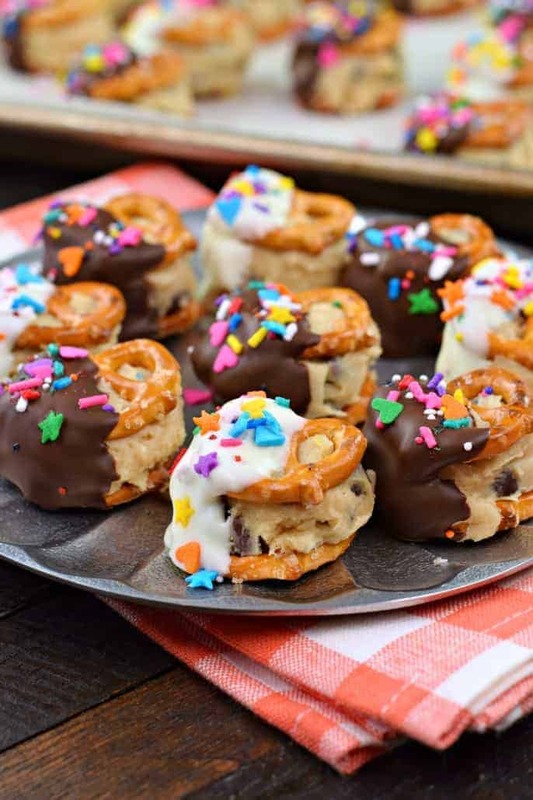 Chocolate Chip Cookie Dough sandwiched between two mini pretzel twists and dunked in chocolate! We’re all addicted to cookie dough. Admit it. You know you’re not supposed to sneak bites of it, but you forget the rules and nibble a little here and there. Sometimes even popping a whole raw cookie dough spoonful into your mouth. Well, no worries today as we’ve got an eggless cookie dough that is safe to eat, bite after bite. Taste after taste! You’ll love the flavor in these, as I’ve added a little cream cheese to the cookie dough! It’s the perfect replacement to the egg in this recipe! And it takes it to a whole new level. DELISH. First, whip up a batch of the delicious cookie dough (recipe below). Line a baking sheet with parchment paper and a single layer of mini pretzel twists. 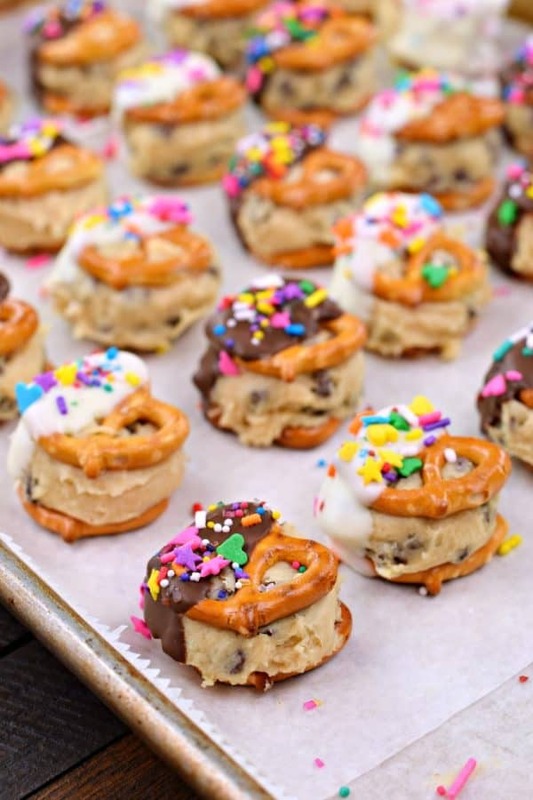 Using a metal 1 Tbsp cookie scoop, drop a dollop of cookie dough onto each pretzel. When you’ve used up all the cookie dough, top each one with a second pretzel, to make a little pretzel sandwich! Put your tray of preztel bites into the freezer (or refrigerator) for about 15-30 minutes. This really helps firm it up before dunking them in chocolate. Use a good quality chocolate. I love Ghirardelli Dark Chocolate melting wafers. They can be found at most chain grocery stores, and also on Amazon. They melt up so much smoother than chocolate chips, and the taste is amazing! Once you’ve dunked half of your Cookie Dough Pretzel Bite into chocolate, place it back onto the parchment paper lined baking sheet and add sprinkles. Sprinkles are not required, but they sure do add joy! 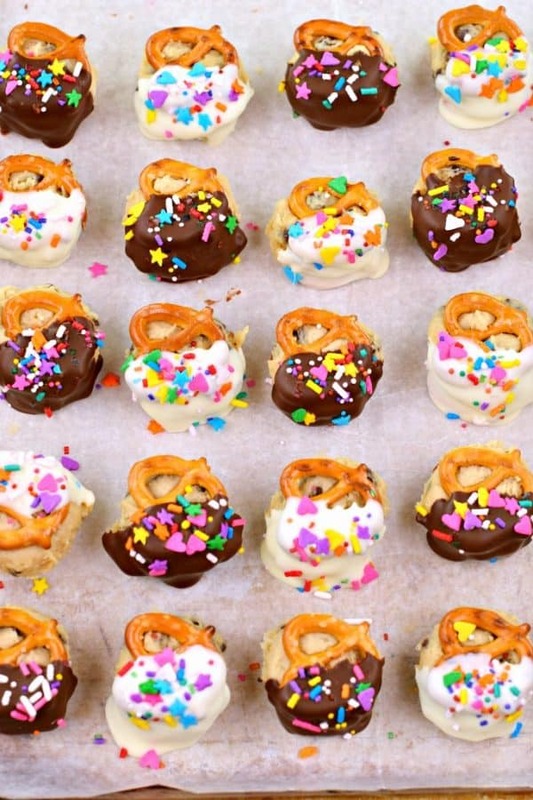 And you can customize these Cookie Dough Pretzel Bites for any holiday by choosing a different sprinkle. 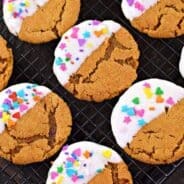 I made half of mine with Ghirardelli White Chocolate Wafers to add a fun twist! Easy and delicious, White Chocolate Cookie Dough Fudge is the dessert you’ve been waiting for! Packed with chunks of cookie dough, what’s not to love? Delicious low carb Snickerdoodle Cookie Dough Truffles. These little balls of edible egg-free snickerdoodle dough from All Day I Dream About Food are easy to make and fun to eat. 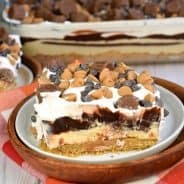 Covered in a homemade fudge sauce and made with a chocolate chip cookie crust, this No-Bake Chocolate Chip Cookie Dough Cheesecake from Real Housemoms just escalated to a dessert must have. Grab a fork, dig in, and be sure to share! Finally, this insanely delicious, super popular Reese’s Peanut Butter Cookie Dough Dip. 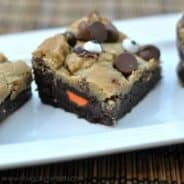 Packed with peanut butter cookie dough, chocolate chips, and Reese’s, it’s a treat that everyone loves! Just be sure to make enough, this one disappears quickly! Beat cream cheese and butter until smooth and well blended. Add sugar and vanilla. Beat in flour and salt. Fold in mini chocolate chips. Line a large baking sheet with parchment paper. Lay a single layer of mini pretzel twists onto the parchment (about 48). Using a 1 Tbsp cookie scoop, drop a scoop of cookie dough onto each pretzel. When finished, top with a second pretzel. Freeze for about 15-30 minutes. 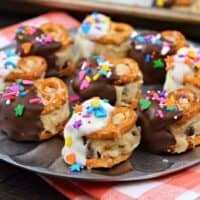 Dip half of each pretzel bite into melted chocolate and return to parchment paper. Add sprinkles immediately. Allow to set (about 10 minutes) and enjoy! *Store in refrigerator in a covered container for up to 5 days. These are best however within 48 hours, the pretzel tends to get soft/stale. These look so fun! And thanks for including my snickerdoodle cookie dough truffles. What a creative recipe! It looks super delicious! Thanks for sharing the details with us!